I’ve been on a lucky streak… I won $97 dollars in Atlantic City on a Deal or No Deal penny slot machine. If you saw the reaction from my sister — when I pick a case with a low number, and she nearly knocked me off my little stool, you would have thought it was $97 MILLION dollars. 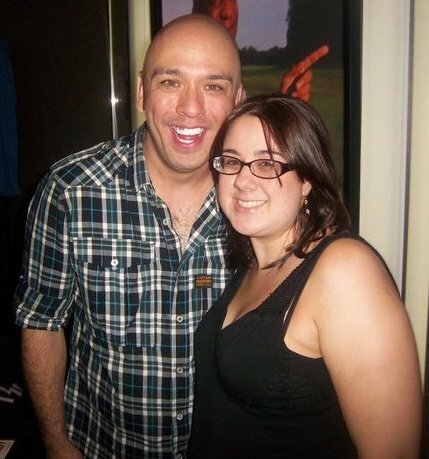 Then, we (my sister, my best ladies basically) went to see Jo Koy, and I laughed like I’ve never laughed before. Seriously my stomach muscles were sore. Then, we all had the chance to meet him, Don’t we make a cute couple? So… yes, back to the lucky streak, won nearly $100 on Friday, and then I won a pair of tickets for Scott Pilgrim vs the World advance screening on Twitter from Midtown Comics on Tuesday. I never win things on Twitter… I’m always retweeting (RT’ing) random things, and it actually paid off. I’m thinking of playing Mega Millions (hey, you never know!) … and I am fantasizing about what I’d do if I won the jackpot of $53 million, which half would go to taxes… so we are looking at roughly $25 million. I know I’d definitely make myself debt-free. No more student loans, and I’d buy a house, no more rent! But, that’s practical stuff, besides the obligatory hooking up my immediate family and Louie and taking my best friends on a fun vacation.